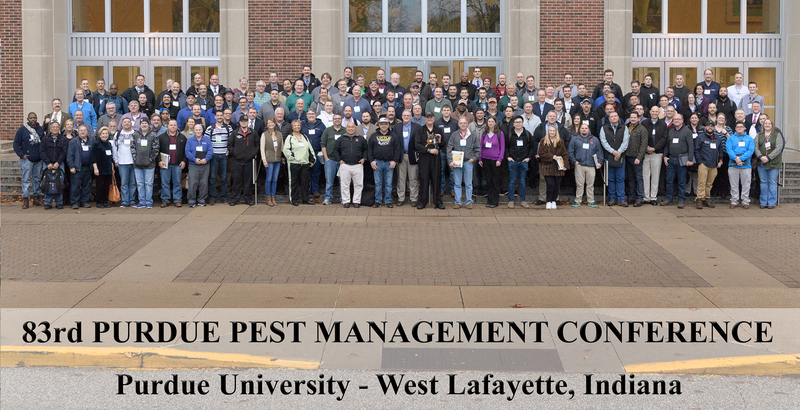 The Purdue University Pest Management Conference is committed each year to providing the information needed for our industry to move forward. The use of new ideas and technologies promote innovative and environmentally sensitive approaches to pest management. The foundation for progressive pest management is built upon strong programs in continuing education and advanced training. Thus, the Purdue Conference has been designed by an Industry Planning Committee to assist you and your company in meeting these goals. All it takes is an inquisitive entomologist! – J.J. Davis, Purdue Entomology Department Head. Add the friendship of the national leader of pest control professionals, Bill Buettner, NPMA’s executive director, and you have the formula for building an educational system on ideals and ethics. J.J. addressed the 1936 NPMA Annual Convention in Cleveland on industry educational goals, which laid the groundwork for the first Purdue University Conference in January 1937. Being the first educational conference for pest control professionals, attendance was expected to be 10 – 15; instead there were 78 registrations from 14 states. J.J. commented “Never have I found a group of persons more eager to aid themselves.” A conference has been held each year since, including 2014’s blizzard conference (with the university officially closed); the desire for an educational update could not be denied as more than 100 professionals organized their own program for a 3-day conference, snowed-in at Purdue’s Memorial Union. 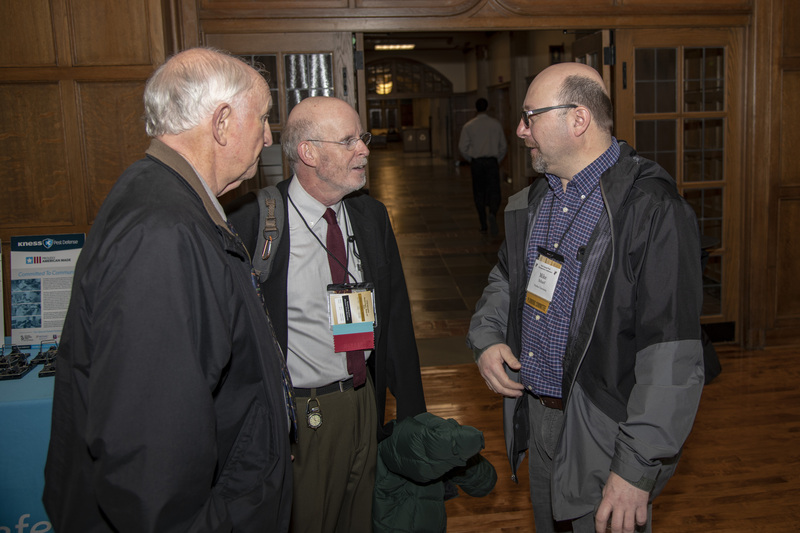 The Purdue Conference has continued to grow, and evolve, as have conferences, workshops, and other educational meetings across the U.S., as well as many countries world-wide. These educational efforts have paved the way for a professional pest management industry, utilizing a spirit of cooperation to address issues, new technologies, and sound pest management practices for the protection of health, property, and food. Within this context, the Purdue Conference will continue to be cutting edge. A CCH/CEU guide will be provided at the conference registration window. This guide will include information on all states’ requirements to receive credits. Keep in mind that different states have different rules and may require you attend the entire conference, specific talks or sessions, or complete separate paper forms. There is also information pertaining to state’s requirements on the interactive map which will be updated as states approve the conference for credit beginning late October. The map will be updated early each week with the latest approvals. 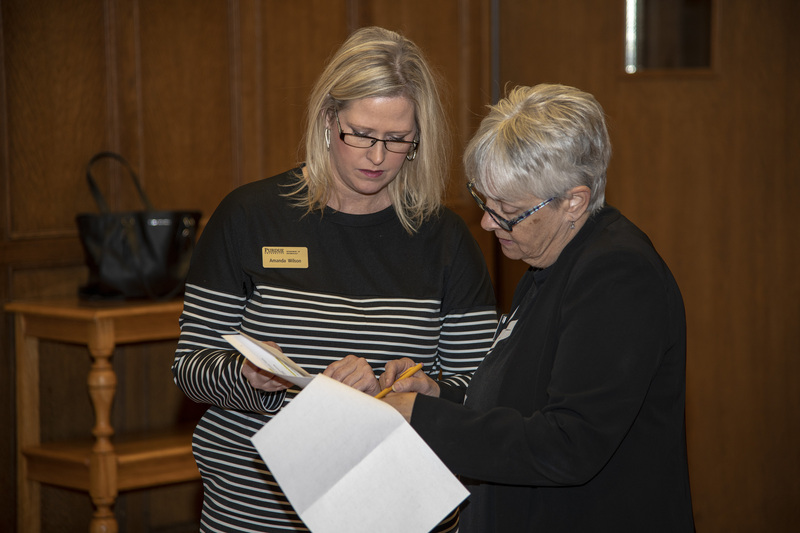 In preparation for the conference, it is suggested that you review your state(s)’s requirements as it may affect your schedule while you are in attendance at Purdue. A completion certificate can be printed for conference attendees who request one during or after the conference. We will confirm your registration and attendance with our conference department before providing a certificate. If you would like a completion certificate please complete the form below. Visit the Office of the Indiana State Chemist if you have questions about your license or other accredited workshops in the area. If you are from outside the state of Indiana and want to view the applicator categories as defined by the OISC, see the list here. Registration opens October 1, 2019. When you arrive at Purdue, please park in the Grant Street Parking Garage (PGG on the map) and enter the Purdue Memorial Union which is just across from the parking garage on Grant Street. 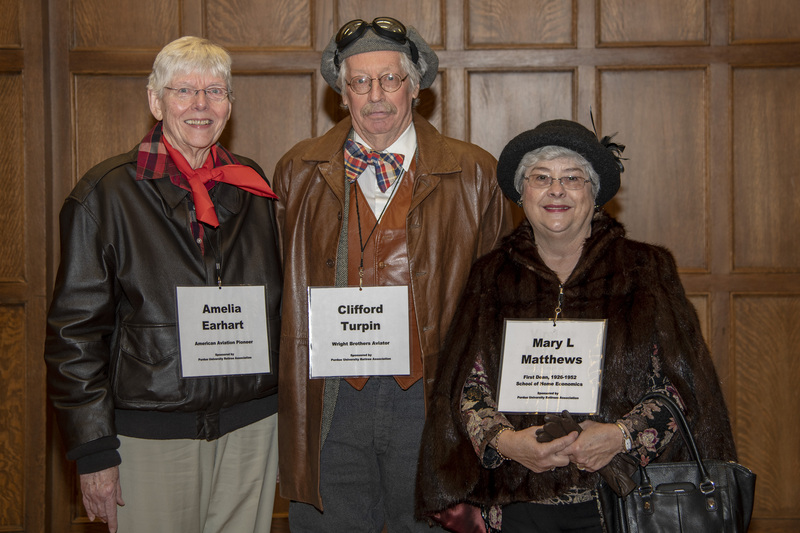 Signs will direct you from the parking garage to the registration window in Stewart Center. There will be an option to order a printed copy during registration. Pre-ordered manuals will be available at the registration window. Exhibition - The Exhibit Hall will be open Monday and Tuesday (hours TBD). Pest Industry Vendors will be set up in the PMU ballrooms. Stop by to learn about the latest in Pest Management Products. Refreshments available. Exhibition Reception - Monday evening the Exhibit Hall will host a reception which includes complimentary appetizers and a cash bar. All attendees are welcome to attend. Be sure to drop by and take this opportunity to meet our exhibitors and other members of the pest management industry. Luncheon - This short program will recognize attendee anniversaries and student scholarship winners. 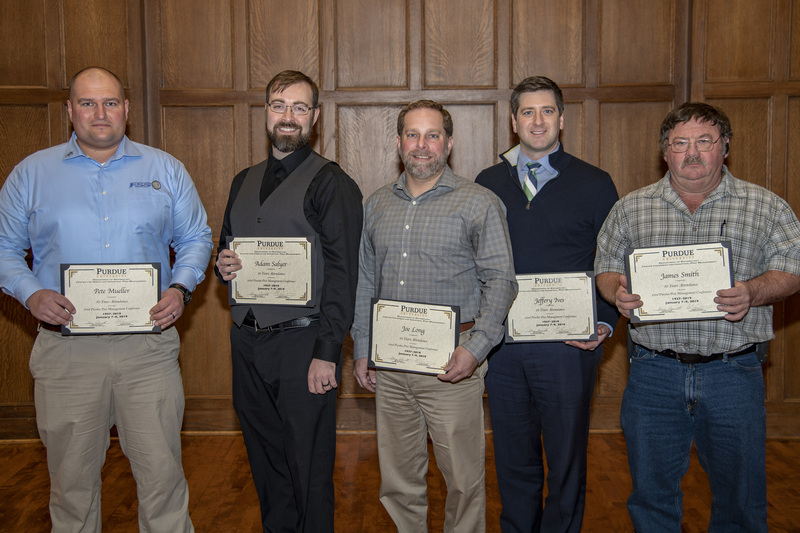 Pete Mueller, Adam Salyer, Joe Long, Jeff Ives and James Smith accepting their anniversary certificates for 10 years of attendancne at the 2019 Awards Luncheon. 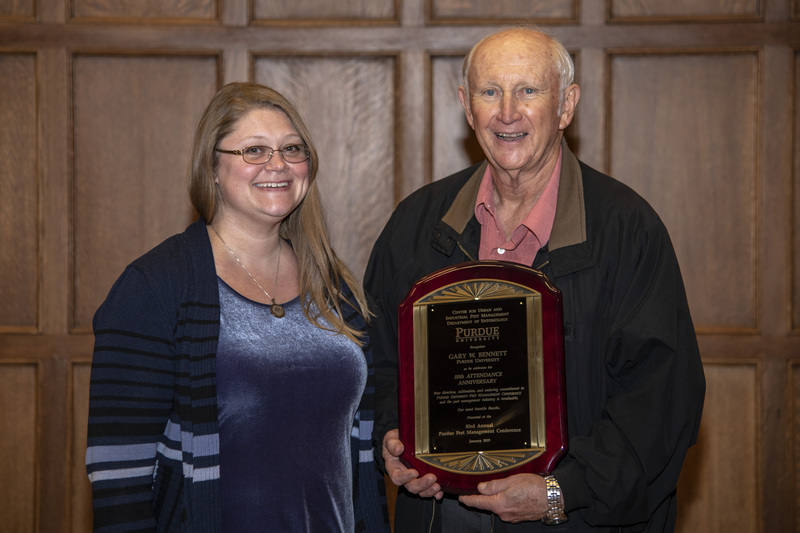 Gary Bennett received an award for 50 years of attendance. Pictured with Holly Fletcher-Timmons. 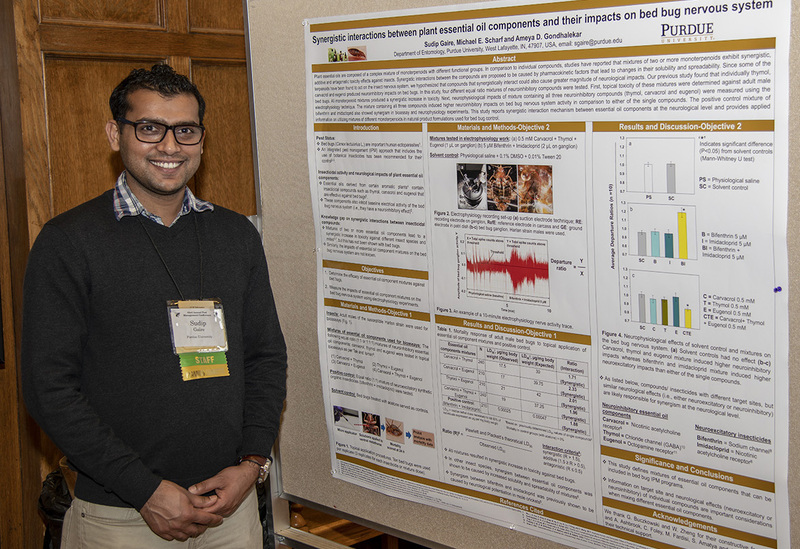 Scholarships - Over $50,000 in scholarships are awarded each year to graduate and undergraduate students in Purdue’s Entomology department. (Left to Right for all rows) Back row: Cecilia Foley, Savanna Ploessl, Nicolas Cazzaniga, Brandon Young, Drew Wennmacher, Carl Bauer III, Connor Brescia, Jack Stevens, Michael Crippen, Lucy Springmeyer. 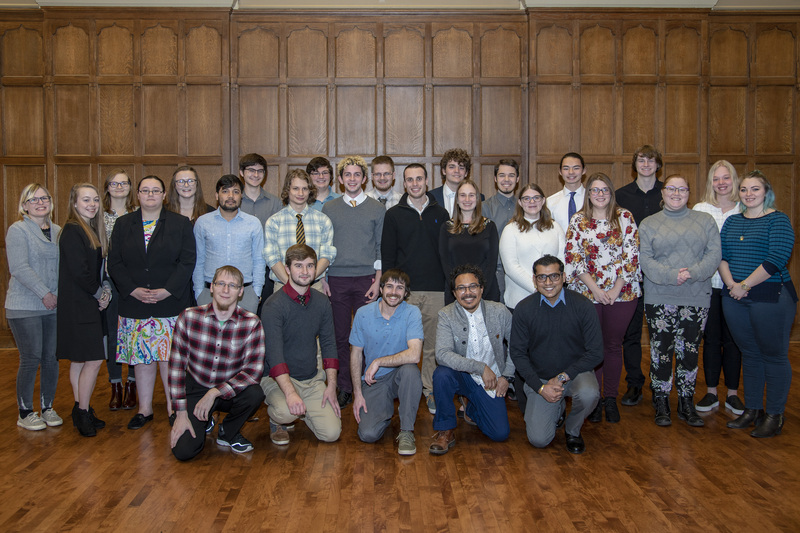 Middle row: Joellen McClain, Maia Leach, Gretchen Thomas, Sujan Dawadi, William (Andre) Le Van, Dayne Hill, Zachary Wolfe, April Grummer, Samantha Hittson, Hannah Ritter, Brianna Pennell, Catherine (Caydee) Terrell. Front row: Mathew Dittmann, Daniel Edwards, Aaron Ashbrook, Julius Eason, Sudip Gaire. 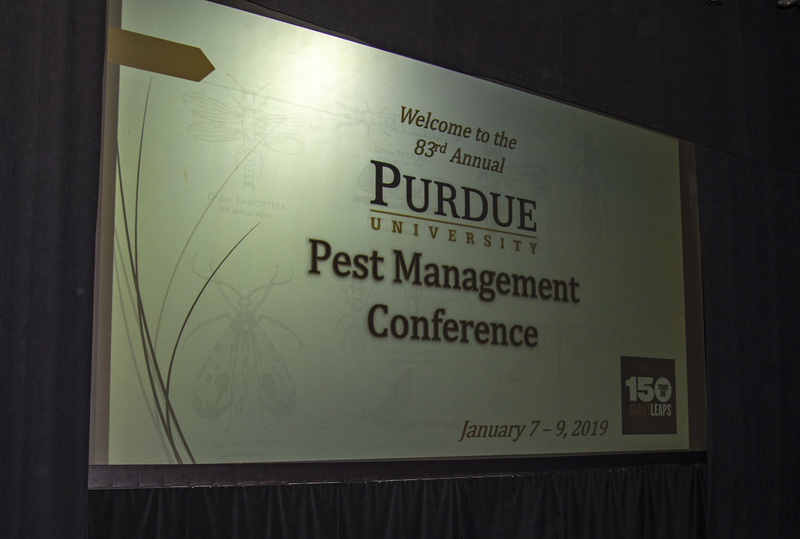 If you have a speaker or topic that you are interested in seeing at the Purdue Pest Management Conference, please share that information with us. We will include any suggestions in our presentation to the industry planning committee when we put together the conference program. All suggestions are considered.